once were displayed in the Prescott College chapel on Grove Avenue. the only European-made stained-glass windows in Prescott." to sell them in 1972.
was no interest by Arizona churches at the time, Brooks said. Eventually, he bought the eight windows for $7,000. paintings. The other two are displayed in a bright corner of Brooks' spacious living room. environment. It was just natural, having been in a Gothic-style church." oxidized with gold and greens are oxidized with copper. which fund-raising efforts are under way. time), in New York City, where he earned a master’s degree in sacred music. his life, fighting in the "Battle of the Bulge" in Belgium. said. “But anyway, I survived it." for one year before he became an organist and choir master with First Presbyterian Church. Ronald Reagan's daughter, Patty, and the son of actor Jimmy Stewart. classical languages has made my life more interesting." lived until she was 98 and his great- grandfather lived until he was 102. 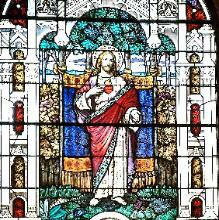 Christ and the Sacred Heart, St. Mary, St Anne and the Annunciation are displayed. Christ in the Garden of Gethsemane. will be given the opportunity to glimpse the windows.